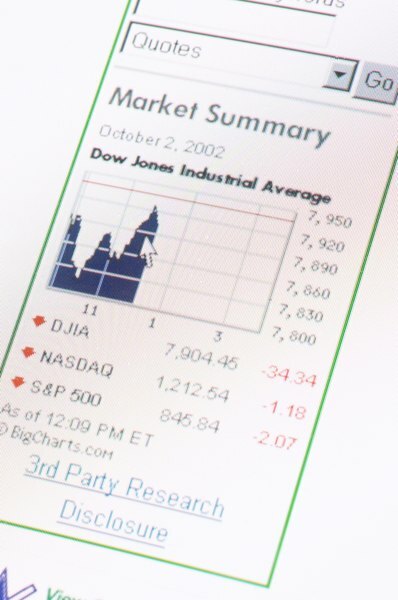 Futures on the DJIA allow for short-term trading of the popular stock index. Futures contracts with values based on the Dow Jones Industrial Average stock index allow traders to make leveraged bets concerning the future of the DJIA. With regular futures trading, the leverage cuts both ways, so picking the wrong direction with a Dow futures trade can turn into a very expensive loser. Options on futures allow traders to set up trades with different risk profiles, changing the costs of a trade and putting a limit on the downside risk. Open an account with a registered commodity futures brokerage firm. Futures brokers and their representatives are required to be registered with the Commodity Futures Trading Commission -- CFTC -- and will also be members of the National Futures Association -- NFA. Download and install one of the trading platforms offered by the futures broker. Most brokers offer a choice of platforms with different features. Discuss the choices with a broker representative based on the type of trading you want to do. Study the trading platform user's manual or call the broker's trading support to learn how to access pricing of the Dow Jones futures and the options trading against those futures. Each type of futures contract has its own account value and pricing. For example, there are Dow futures contracts valued at both five and 10 times the value of the stock index. The options prices for each contract type will be priced to match the specific futures contract. Practice buying Dow futures options using the simulated trading account provided by your broker. All futures brokers include a simulated account log-in when you get a real money account. The simulated account can be used to familiarize yourself with the trading platform and to try out trading strategies. With options, call options generally are purchased to profit from a rising futures price and put options gain in value if the futures price declines. Start live trading Dow futures options once you are comfortable with the trading system and your results using the simulated account. Your live account will use the same software with a different log-in and password. Make sure you always know which account you are currently logged into. Options trade against both the regular $10 Dow futures and the e-mini $5 Dow futures. The cost of an options contract will be the quoted price times the multiplier. For example, if a certain call option on the e-mini Dow has a quote of 200, one call option contract would cost $1,000. Call options give the right to purchase the underlying futures contract at a specific exercise price, called the strike price. Put options give the right to sell the underlying futures at the strike price. A purchased Dow futures option trade turns profitable when the futures price moves past the option strike price by more than the cost of the option. Consider a put and a call option on the Dow, each with a strike price of 12,000 and a cost of 200. The call option will be profitable if the Dow Jones index and futures price climbs above 12,200. The put option is in profit territory if the Dow drops below 11,800. The maximum loss when buying put or call options is the amount of money you paid for the contracts. If exercised, one Dow futures options contract gives you one futures contract. An exercised call option will result in a long futures position and if you exercise a put option you would have a short futures trade position. Futures option contracts are rarely exercised because any remaining premium in the option would be lost. The way to get out of a purchased options trade is to make an offsetting sell trade.